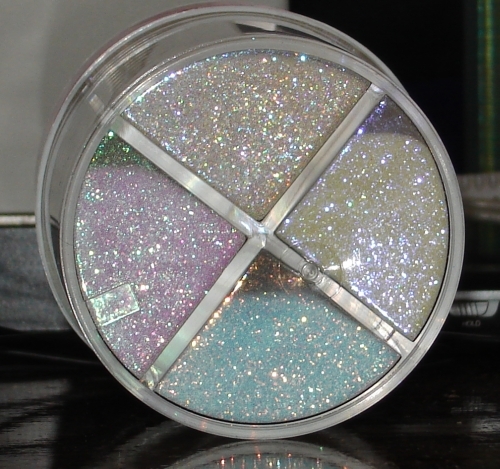 Ah, I love having an chance to play with some new products. Recently I wandered through Kent Hardware store (Kent are the spawn of Irving, a New Brunswick company) and discovered that they are ceasing to carry the Pebeo line of art supplies. 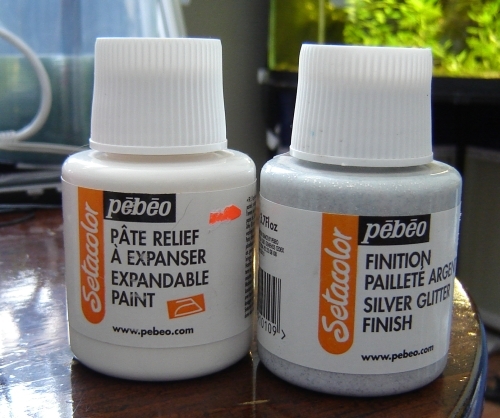 The remainder of the paints were seriously discounted (I paid $1.30 CDN for a $7 bottle) and included some of the silver glitter finish and the expandable paints. Score! The silver glitter finish isn’t bad at all. 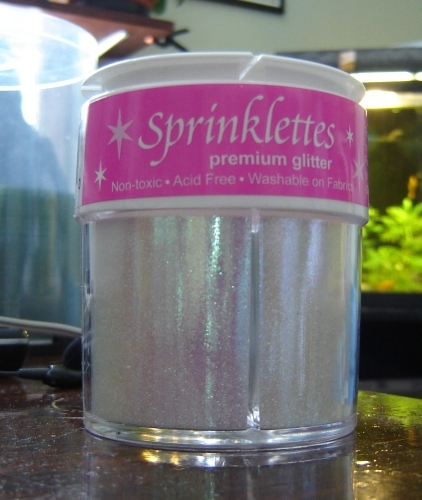 It’s basically glitter in some sort of acrylic medium suitable for use on fabric. You can paint it on already painted and dried fabric and the base dries clear. 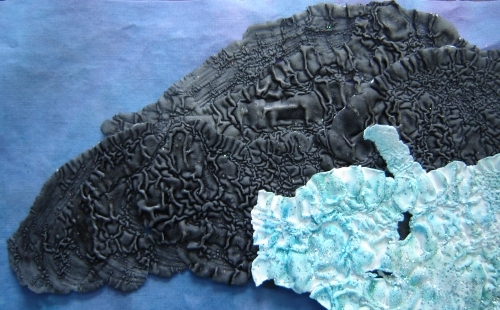 You can also mix it in with the other acrylic-based paints. Opaque paints will obscure the glitter a good bit (unless the glitter happens to be on top of the paint), but the transparent paints mix well with it and the transparency of the paint allows the glitter to shine through, although the sparkle is somewhat diminished. The glitter hold on well during a wash (I didn’t machine dry it) and is fine after being ironed with a pressing cloth (ironing the fabric from the back would likely achieve the same effect). It seems to rub off a bit when you rub it hard, so it’d probably be better for things that got minimal abrasion and washing. The sparkle of this isn’t overpowering, also, so it’d be reasonable to use moderately in landscape quilts (snow in moonlight, for instance, or water shimmering). Heat setting makes a definite difference to how well the glitter adheres, btw. The expandable paint was also rather niffy. I’d read about it a bit in Quilting Arts (issue 24, winter 2006 – Linda Schmidt) and was therefore rather keen to add it to my repertoire of techniques and tools. Finding it on sale was an added bonus! But I like the effect. It’s white and dries white, so tinting it before using is helpful. 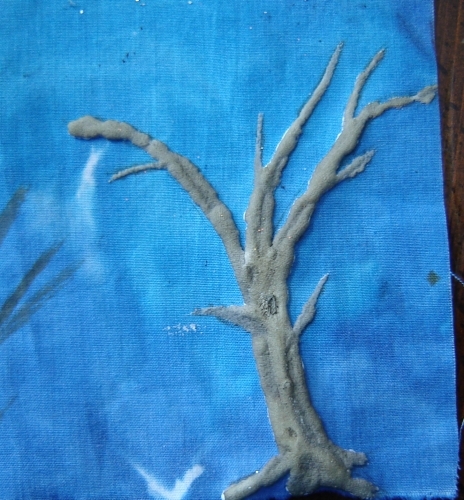 After it has dried and then been heated, you can rather easily paint right over it as I did with the tree above. A keeper as far as materials go! Finally, I ‘ve been playing with the Sprinklettes (not a girl group from the fifties), purchased at Michaels. it gets everywhere. And I mean everywhere. Places that will astonish and thrill your husband kind of everywhere. Now that I’ve got the sparklies out of my system (and underwear), I’m off to do some preliminary sketches for another series. First rule of micro-glitter: never – ever – sneeze. I think that’s all I really need to say. That glitter sounds like scary stuff! I enjoyed your explanations about how each of these paints work. Thanks. My husband loves the sprinklettes. He bought some at Micheals also. Do you have any idea how we could get a catlog of there glitter. We use a lot of it in our business. Hi Juanita, no, I don’t know off-hand. It’s made by a company called Glitterex Corporation… hang on…..
Ah, the power of Google! I am from Ohio…and the Michaels stores around here do not carry Sprinklettes :o( Can it be ordered online from another place? I looked at Glitterex…however, a min. order of $500 would be more glitter than I would know what to do with… hehe. I really wish Michaels had online ordering.